it doesn't look perfect, but it is a base for a nice BT. you can build it very quick and it's cheap... if you have miners ^^. now you can add some CD-symbols, chaos-stuff, other bolts etc... i enlarged the arrow. really clever use of spare bits Snotling ��looks alot better than the wooden BT's I think! That's very clever, well done. I've used this same idea to make a 'gatling blunderbuss' for my unit. I took off that leg on the front, chopped down the legs a little and took the spy glass off the top. Pics will follow once I've built the other 3 CD on the base (40mm). Holy Crap that is Great!! If CD were ever to have a bolt thrower that wasnt made by hobgobs then that would be awesome!! That looks like some ancient kind of Sniper. Thats a great idea. Mechanical bolt thrower. Great Idea that! I am really impressed. That is some nice use of spare parts. Especially as the "portable steam-engine-hammer" is a bit over the top from a mechanical point of view. Talking about miniaturisation. 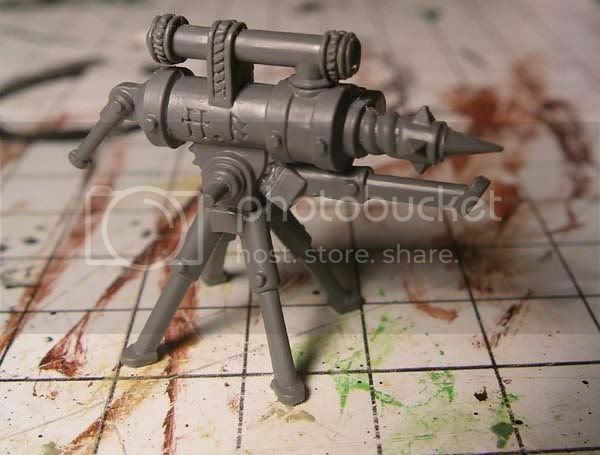 But it makes a really cool bolt-thrower. Great job there Snotling! I dare even say - as usual I was thinking of such conversion for quite some time. Although the idea of elongating the arrow is brilliant! I wonder, why you have only one slave? You've one of the greatest army in the showcase and yet, only one slave. Do you kill them for inspiration? Have one slave from me, for this great piece of work. And with an additional slave, I guess we could see the painted model sooner, eh? Yes Snotling once again a great job. But I liked you scratch build-version back in august even more. What is the idea for hobbos this time? Btw - haven't seen much from you hand lately - working on something big - are you? WOW great idea .That's a cool harpoon so cool im stealing this idea. 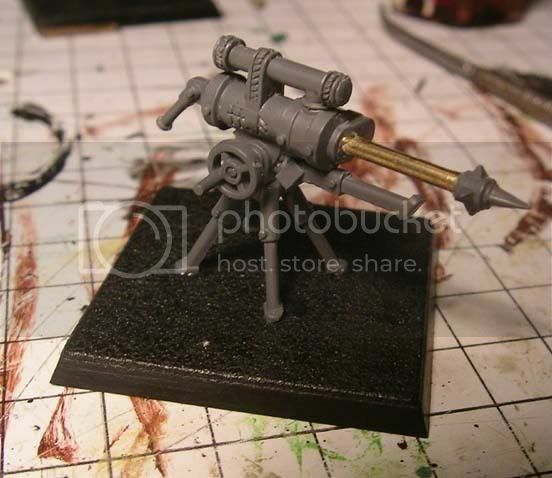 It reminds me of the Harpoon Guns Chaos Dwarfs had back in 3rd Edition. I did something similar using bits of a Defiler and an Imperal Guard Rocket Launcher. Is the miner set worth it on the whole? I suggested something similar over on the Cut-throats den - making a harpoon gun using the sight on legs from the dwarf cannon box. With the miners harpoon gun, I have been thinking of cutting off the harpoon and attaching the rotating barrels from an Empire repeating rifle to make a gatling gun - a bit of a blunderbuss unit filler. The same could be done to the steam drill to make a man (dwarf?) portable gatling gun.